With the Olympics on the other side of the globe, one might ask—what elements can make Canadian athletes feel at home while they are competing for gold? 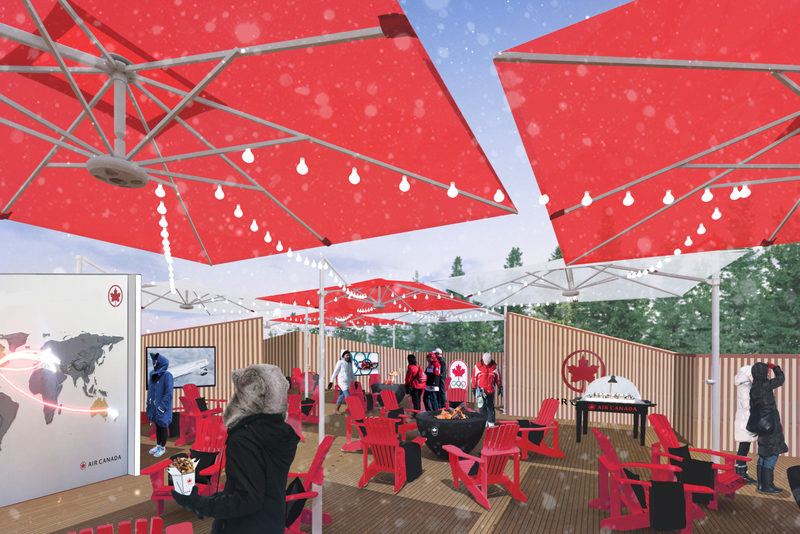 Sid Lee Architecture have answered this question by defining Canadian domesticity abroad in their design for the Canada Olympic House (COH) at the 2018 Winter Olympics in PyeongChang, South Korea. Colloquially known as COH, this domestic structure serves as a home-base for Team Canada athletes and their visiting friends, family and supporters. While it isn't a conventional 'house', COH acts as a space where participants and visitors can lounge for the duration of the Olympics. It also serves as a meeting place to cheer on fellow Canadians as they compete. 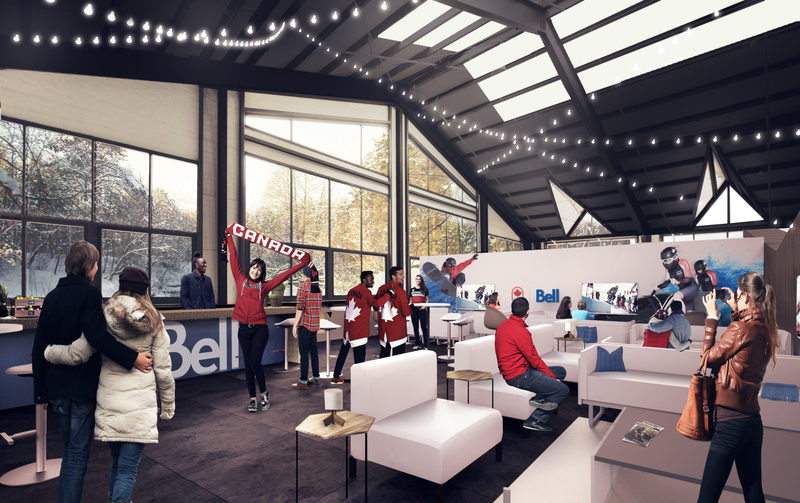 Serving as a symbol of home overseas, Canada Olympic House opened when the 2018 Winter Olympics began on February 7th. As the world experiences the wonders of South Korean culture, COH will act as a pocket of Canadian hospitality abroad. COH is an ingenious way to put great Canadian design on display. Designed by Montreal firm Sid Lee Architecture, this year’s house is an adaptive reuse project. Located in Gangneung Olympic Park on South Korea’s east coast, it's a 12,000 square foot existing facility being transformed into a space to accommodate over 10,000 guests throughout the Winter Olympic Games. 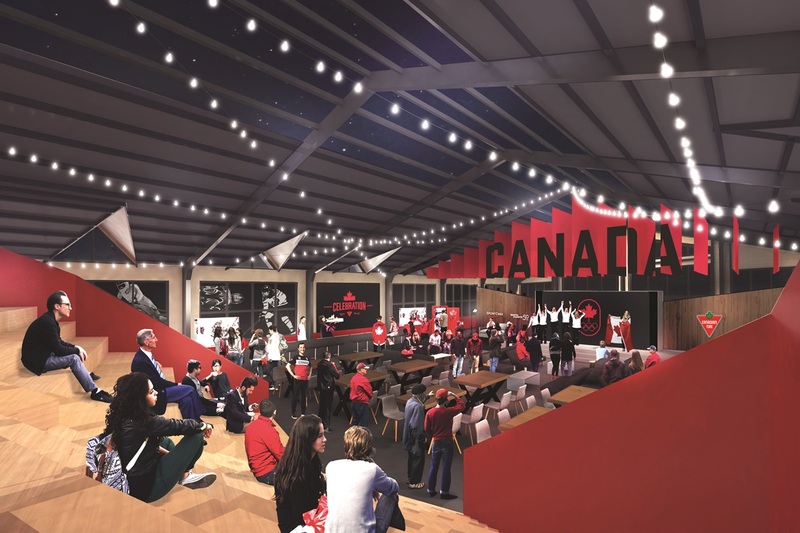 Some of the distinct 'Canadiana' design elements of COH include a maple-leaf shaped set of bleachers for fans to view Olympic programming, rafter-hanging banners reminiscent of ones found in old hometown hockey arenas, a patio decked out with bright red Muskoka chairs as a nod to Canadian cottage life, as well as depictions of mountain ranges to evoke images of Canada’s West. COH has been created in conjunction with a variety of very Canadian sponsors. To keep the house comfy, the Canadian Tire Corporation provided over 500 products to furnish the rooms. The house is also stocked with replicas of apparel and accessories sold at a Hudson’s Bay store. Air Canada will be adding the most essential ingredient of all: complimentary poutine for fans—which will surely make them feel right at home. 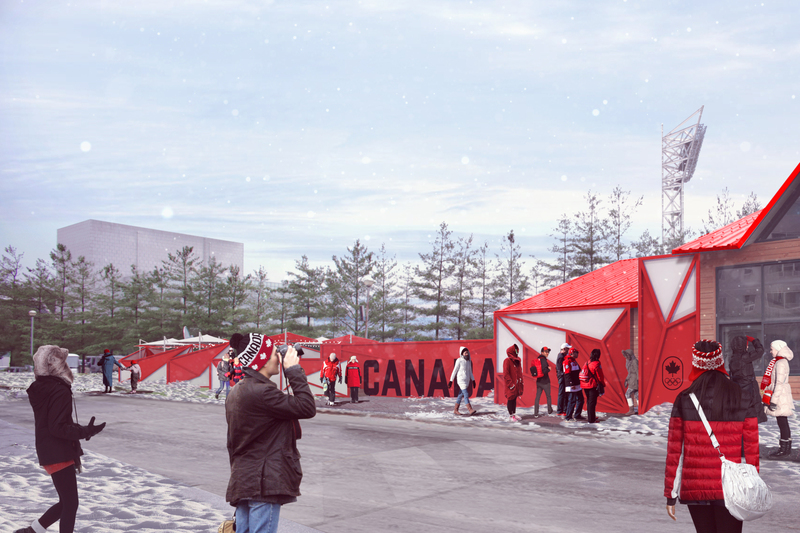 According to Sid Lee Architecture, Canada Olympic House will act as a “physical representation of Canadian Olympic spirit outside our borders.” To me, it stands as an epitome of patriotic Canadian design. Furthermore, in an act of inclusivity, Canada Is Using The Space To Host Pride House, a safe space for LGBT athletes at the Olympics. How amazing is that? All photos courtesy of Sid Lee Architecture. Researched and written by Carling Fraser, Urban and Regional Planning, Queen’s University.